GREAT PERFORMANCES marks the first anniversary of the passing of one of opera’s most cherished voices with Pavarotti: A Life in Seven Arias, Wednesday, September 10 at 9 p.m. (ET) on PBS (check local listings). Presented by Thirteen/WNET New York and combining archival and rarely seen performance footage with fresh reminiscences by friends and colleagues, the 90-minute musical feast offers a concise yet compelling look at the tenor’s meteoric career trajectory. From soccer-playing son of a Modena, Italy, baker to onstage partner of “La Stupenda,” world-renowned soprano Joan Sutherland, from media darling to truly one-of-a-kind superstar, it is a story writ as large as the great one himself. But, as all agree, it was the voice, with its unique golden timbre, that will be the enduring legacy. His recordings of the 1960s, ’70s and early ’80s offer the definitive performances of the great romantic operas – Rigoletto, Turandot, Lucia di Lammermoor, La Fille du Regiment, among them. “I think that Luciano had the sun in his voice,” says fellow Three Tenors partner Jose Carreras. “It was such a bright, pure sound.” “One of the greatest ever,” adds the third illustrious member of the trio, Placido Domingo. Assembled by acclaimed filmmaker David Thompson (GREAT PERFORMANCES’ Busby Berkley: Through the Roof, Copland’s America), Carreras and Domingo are joined by sopranos Sutherland, Montserrat Caballe and Renata Scotto; p.r. whiz Herbert Breslin, credited with creating the Pavarotti Phenomenon; and Terri Robson, the tenor’s manager from 2000 until his death. Also on hand: delightful young Peruvian tenor Juan Diego Florez, who tells of dialing the maestro on his cell, moments before stepping on stage at Covent Garden to attempt the killer high C’s aria, “Pour mon ame,” made famous there by his idol 40 years earlier. 1) “Che gelida manina,” from Puccini’s La Boheme, the opera that marked Pavarotti’s debut and shown here in a rare 1965 performance from Modena with Mirella Freni. 2) “Pour mon ame,” from Donizetti’s La Fille du Regiment, the work he toured with Joan Sutherland. Its famous aria and nine astronomical high notes he detonated from the stage at Covent Garden earned him the sobriquet King of the High Cs. 3) “Panis Angelicus,” the haunting Cesar Franck work he sang as a youth in Modena with his father. The duet affords a visit to his beloved hometown and a chance to recall friends there and participation in the city’s renowned Rossini Chorale. 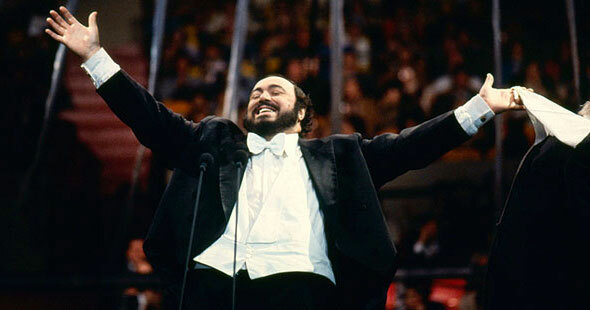 4) “Questa o quella,” from Verdi’s Rigoletto, marking the beginning of the Pavarotti media blitz. 5) “Nessun dorma,” from Puccini’s Turandot, the aria he makes his own and immortalizes in the first Three Tenors concert. 6) “E lucevan le stelle,” from Puccini’s Tosca, underscores the last years and final Met performance. 7) “Ingemisco,” from the Verdi Requiem. GREAT PERFORMANCES is funded by the Irene Diamond Fund, Vivian Milstein, the Corporation for Public Broadcasting and PBS. Major funding for this telecast was provided by The Anna-Maria and Stephen Kellen Arts Fund and the LuEsther T. Mertz Charitable Trust.